On July 1, 2012. 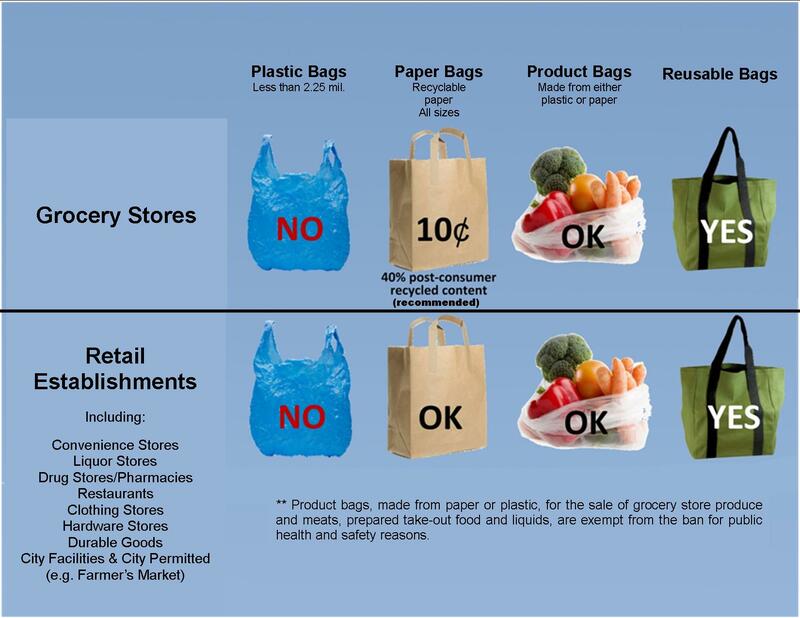 Retail establishments must stop distributing single-use carryout plastic bags, and grocery stores (including supermarkets, convenience stores, liquor stores, and gasoline stations) must begin charging ten-cents for recyclable paper carryout bags. Why is there a ten-cent fee on paper carryout bags? The fee on recyclable paper carryout bags encourages the use of reusable bags. The cost pass-through reimburses retailers for the costs of providing paper carryout bags to their customers. All the revenue from the cost pass-through remains with the store. 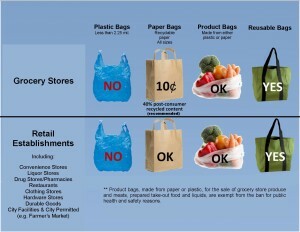 Consumers can avoid the cost by remembering to bring their own reusable bags to the store. How are single-use plastic carryout bags harmful to the environment? They are consumed in extremely high volumes. They are produced from non-renewable resources. They are designed to be disposable rather than reusable. They are difficult to recycle. Less than 5% of the 19 billion plastic bags used annually in California are actually recycled. They are a significant hazard to marine animals and birds, which often mistake plastic bags for food.